Margarita McGrath and Scott Oliver of Noroof Architects termed the 1,650-square-foot house in Greenpoint, Brooklyn, “Pushmi-Pullyu,” in reference to the interior-exterior flow they created. Resident Jill Magid, pictured on her front steps with son Linus, is a conceptual artist; she fabricated the neon house numbers. An ample sill made of English elm was built into two front windows to create a gathering spot that is visually connected to the street. Donna Wilson’s lively Ernest pouf in coral Nos Da upholstery for SCP adds extra seating in the living room. A vintage sofa purchased from Open Air Modern mixes with Low Pad chairs, by Jasper Morrison for Vitra, in the living room, which features a window inspired by Marcel Breuer’s Whitney Museum of American Art. In the kitchen, matte Caesarstone tops an island composed of custom millwork and stainless-steel Ikea cabinetry. A bright-green Vola faucet adds an idiosyncratic touch of color. The second-floor bathroom includes a washroom that can be closed off from the bathing area with a sliding glass door. Bauer and Magid can supervise the kids’ baths or use it as a steam room. A Godmorgon vanity from Ikea is paired with white field tiles from Mineral Tiles. An interior window creates flow between the skylit landing and baby Banks’s room. Magid selected lively Whitby wallpaper by Mini Moderns for Linus’s room, along with Oeuf’s Perch bunk bed. The homeowner found the light-up rocket-ship mobile on a trip to Mexico City. Floor-to-ceiling windows accentuate the home’s indoor-outdoor flow and connect the first-floor dining room to a patio. The vintage Russell Woodard dining set came from the Brooklyn Flea, and the Sterling II barbecueis by Tec. Blackened steel for the Noroof-designed minimalist staircase matches the living room’s “Breuer” window; reclaimed ash flooring came from a demolished church in Ohio. If it’s not the raw brick siding, it’s the house numbers—a sleek neon “175” in sans serif font—that give it away. The miniature, functional art piece is the work of Jill Magid, a conceptual artist. 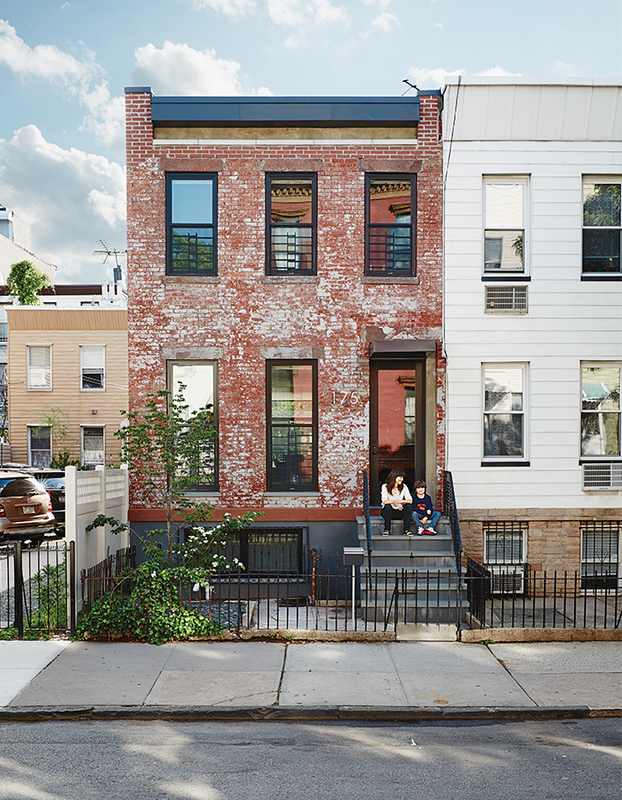 She and her husband, advertising executive Jonny Bauer, finished a head-to-toe remodel of their row house in the Greenpoint section of Brooklyn in mid-2013, and those neon house numbers act as a modern beacon on an otherwise unremarkable street. The couple bought the home—located at the end of a row of three matching turn-of-the-century workers’ homes—in June of 2011, then hired local firm Noroof Architects for the renovation. The five-month permitting process was the first stumbling block; during inspections with their architects, engineers, contractors, and city officials, they learned that the light remodel they had anticipated was turning into a major gut job. “But we were so determined to keep the shell,” says Bauer. Because of the extensive structural work required in the renovation, material decisions were not taken lightly. Magid and Bauer invested most of their funds in the reclaimed flooring and a few pieces of custom woodwork in the kitchen that surround off-the-rack Ikea cabinetry. They also splurged on an outdoor barbecue by Tec that the family regularly uses to cook, even in the winter. “Being Australian, this is most important to me,” Bauer explains. “We cook 70 percent of our meals here.” Economical choices include James Hardie cement-panel lap siding for the back facade, simple Decorators White paint by Benjamin Moore, and concrete masonry unit walls and a concrete floor slab for the first-floor rear extension. Despite well-laid plans once the construction got underway, the layout changed when the family learned that Linus would be getting a younger sibling. The family had Noroof reconfigure the upstairs so that the master bedroom, initially slated for the front of the house, moved to the rear extension, next to a shared bathroom. Baby Banks, now a year old, occupies a petite chamber carved out on top of the stairwell—complete with a window onto the upstairs landing and a built-in changing table—next to his older brother’s room. Linus resides in the “quietest room in the house,” which is outfitted with a bunk bed by Oeuf, nautical wallpaper, custom floor-to-ceiling built-in storage, and a rocket-ship mobile scored on a trip to Mexico City. In the year since its completion, the neighbors have taken to the reconstructed home. “Some of the old houses have been demolished, so people have thanked us for saving ours,” says Bauer. “They bring us cheesecake once a week. Our son walks their dog. It’s pretty safe, and it’s a real neighborhood.” Judging from the number of passersby ringing the doorbell to catch a glimpse of the makeover, the new-old house is a welcome addition indeed.